Royalty and grace- two words that describe the legacy of pearls perfectly. Pearls add a quotient of elegance to the look of any lady who fashions them, and there is no reason for our brides to not drool over this precious gem. 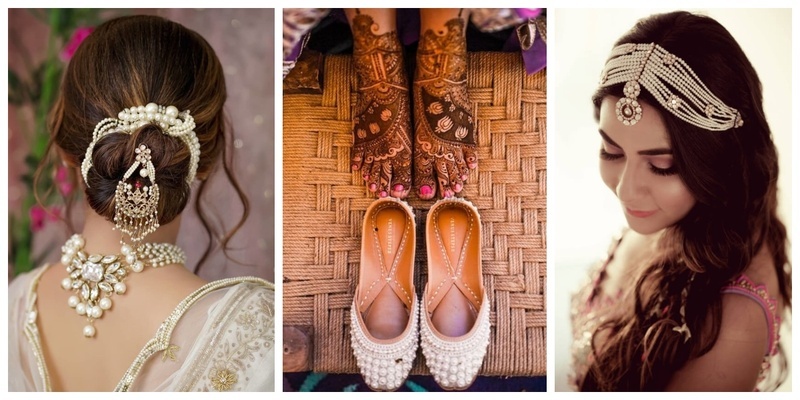 Check out these absolutely stunning ways in which brides today are including pearls in their jewellery sets and adding a charm to their gorgeous bridal look. Simply adored the pearls dangling off this bride’s Maatha Patti! The embedded pearls in the entire jewellery set of this bride is simply alluring! This cute “ladkewale” caption in this juda pin is so cool! The pearl necklace and the pearl gajra complete the look of this bride with perfection! 6. Jaw-dropping gorgeous naths with pearl finish! I’m totally drooling over this bride’s larger than the life nath! Trend Alert, ladies! Floral naths are the new trend in town! How can we forget the pearl embedded minimal nath of our bubbly bride Anushka? This spunky bride’s statement silver piece with decorative pearls is a perfect choice for her pearl embedded pastel pink lehenga! 9. Gorgeous bridal necklace with pearly edges! Shweta Tripathi who recently got married in a totally dreamy affair wore absolutely gorgeous bridal jewelleries with layered pearls. I just adore the idea behind this jewellery. I mean, creating a sea-shell like ring is just the coolest way to include pearl in a jewellery, don’t you think? I cannot just stop staring at this gorgeous ring and haath phool. The pearls in the ring have been brilliantly used as a star to the beautifully carved moon. So brides to be, how are you planning to include pearls in your bridal look? Image Source Pinterest unless specified.